$19.99 (unsigned) or $22.99 for a DVD signed by Martin Parr. 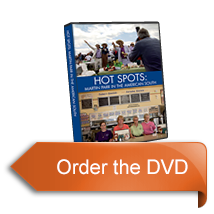 And now, Hot Spots is available with French subtitles - $2 extra with the purchase of a regular DVD. Acclaimed Magnum photographer Martin Parr focuses on Atlanta while documentary filmmaker Neal Broffman turns his lens on Parr. An insightful and humorous 30 minute up close look at the artist in the creative process. From the car wash to the doggy daycare, to gallery soirees and tattooed partiers at the Drive Invasion, Parr’s double-edged British humor and razor sharp social commentary are exposed through his images and his many interactions along the way. While Parr's work is in the Museum of Modern Art, The Philadelphia Museum of Art and The Getty, among other American museums, as well as being in the collections of museums and private collectors around the world, the Atlanta series is the first time Parr has been commissioned to focus on a particular region within the US. The commission, made by the High Museum of Art, is Martin Parr at his best. The film features interviews with Parr, deYoung Museum Chief Curator Julian Cox, the writer and critic and former front page photo editor for the New York Times Philip Gefter, photographer John Gossage, and Magnum photographer Susan Meiselas. Also included are three slideshows with more than 100 Martin Parr images, including a series of Atlanta images not available elsewhere. As a bonus there are several short scenes that deal with some of the more technical aspects of Parr's work and an extended 6 minute scene with Parr advising a group of photography students about what to expect in the real world of professional photography. A PayPal account is not required to purchase the DVD.